Okay, even if you don’t looooove chain hotels, you gotta admit — the free breakfast is awesome. Even if it’s just a bowl of cereal or a pastry and orange juice, that’s one meal out of the way. You can avoid taking your gang of ravenous, borderline-manic children into a Denny’s or breakfast diner (hmm, or is it just me with that problem?). Your breakfast will not look like this. “Breakfast- Time” painting by Hanna Pauli. I created this list of free breakfast-serving hotels in Oregon, Washington and British Columbia. Some of these are not just fine, but great — you’ll get a hot meal, a cooked-to-order breakfast omelet or an evening reception. Not bad at all. Many chain hotels also provide indoor pools (preferable in our always-undependable climate) so the kids won’t mind if there’s not much of a personal touch. Free breakfast and a pool — I’m ready to go now. Caveats: Check with the specific property you’re booking to make sure that they are offering breakfast. Always, always check. 1. Staybridge Hotels. These hotels offer a hot buffet breakfast, including fresh waffles. Evening receptions as well, Tuesdays through Thursdays. See the lists of Staybridge Oregon hotels, Washington hotels and BC hotels. 2. Embassy Suites. Free breakfast might include a cooked-to-order omelet, bacon, eggs, breakfast potatoes and pastries. Also, an evening reception (with wine!). Most locations are clustered in the Puget Sound and Portland. Also in the Hilton family: DoubleTree sometimes offers a continental breakfast. The roomy Homewood Suites provides a full, hot breakfast like Embassy Suites — along with a weeknight free manager’s reception featuring dinner items. Most are in the Puget Sound, Vancouver/Portland metro and in Medford, Oregon. Oh, and 15% off for active and retired military service members. 3. Comfort Inns. The common Comfort Inns now advertise a free hot breakfast, including eggs, sausage, waffles and fresh fruit. Many locations in Oregon, Washington and Canada. 4. Oxford Suites. This contemporary-focused hotel chain has a free buffet breakfast and many also offer family rooms. Locations on the Oxford Suites map ? Six hotels in Oregon, six hotels in Washington State — stretching from Klamath Falls, Oregon to Silverdale, Washington. 5. Hampton Inns. While not so common throughout our area, Hampton Inns have a free hot breakfast served daily, with fresh waffles and oatmeal. If you’re in a hurry, the “On the Run Breakfast Bag” gives you the basics: apple, cereal bar, muffin, water. Check the map in this Hampton Inns link to find two in Oregon (Salem and Astoria), two in BC (Vancouver and Surrey) and more in Washington. I’ve stayed at the one in Burlington, and found it just fine, with easy access into the North Cascades. 6. Ramada Limited, Super 8, Travelodge. The Wyndham family offers free continental breakfast at many of the budget properties, including Ramada Limited, Super 8, and Travelodge. I’ve stayed at Super 8s a few times; not my first choice, but it might be yours. See this listing of BC Ramada properties and use the Ramada map for Oregon and Washington free-breakfast hotels. 7. Holiday Inn Express. This hotel chain isn’t skimping on the free hot breakfast bar; here you’ll find cheese omelets, bacon and sausage, biscuits and gravy, cinnamon rolls, an assortment of cereals and pancakes at a few locations. View the British Columbia Holiday Inn locations, Washington State hotel and Oregon hotels. 8. Best Western Plus. Best Western Plus provides a free breakfast at the PLUS locations (and even then, I would call and make sure — also, some non-plus locations will offer breakfast too.). Here are locations for Best Western in Oregon, Best Western in BC and Best Western in Washington. 9. Days Inn. Pick up a complimentary breakfast at “participating locations,” Days Inn says. Which means you should double-check, but you’ll probably find the juice and pastries out at Oregon Days Inns and Washington State Days Inns. More than 108 Days Inn hotels dot British Columbia. 10. La Quinta Inns and La Quinta Inns and Suites. La Quinta Inns and La Quinta Inns and Suites serve up a continental breakfast. These properties are mostly found in Washington and Oregon, with just one in Richmond, BC. 11. Country Inn and Suites says that their free breakfast choices vary, but could include waffles, scrambled eggs, crispy bacon, hard-boiled eggs and biscuits and gravy. Nom. Unfortunately, there aren’t many in the Pacific Northwest — one near Puyallup, one in Portland, none in BC. 12. Residence Inn, Fairfield Inn and Suites, Springhill Suites and TownePlace Suites. Several of the Marriott family of hotels offer free breakfast (hot and continental), including the Residence, Fairfield, Springhill and TownePlace. Only a handful in BC (a Fairfield in Kelowna, a Residence Inn with free breakfast in Vancouver), but there are many free breakfast buffets in the Washington hotels and in Oregon hotels. It’s festival season here in the Pacific Northwest and British Columbia. We’ve got festivals of every stripe — berry festivals, Shakespeare festivals, folk festivals, medieval festivals, rose and rodeo festivals. Our family recently went to the Folklife Festival with our kids, and here’s a packing list I created. These items fit into one small backpack ( thankfully, we didn’t need any rain gear), which we slung over the stroller, along with the small cooler. Tissues for well-used portapotties and for sad songs. One or two plastic grocery bags or small Ziploc bags. Because. Beach towel for grassy areas or a pashmina-style shawl – can be used for warmth, to sit on, last-minute cleanup, etc. A chapter book you can read to them during slow times. $5-10 spending money per child for cotton candy, small toys, etc. A method for transporting them when they’re tired (and whiny). Do not discount this aspect, even if you think your child is too old for a stroller. When the choice is A) leave early with a whining, unhappy child or B) let them nap/color/blow bubbles in the stroller despite the disapproving eyes of parental passerby (holding whiny kids) …yes, you should choose B. I’m not saying I would stuff my teen into a stroller, but a 5 year old? Yes. If you think the area will be uneven (think grassy fairgrounds), you may want to bring a child carrier instead. Baby jogger-style strollers can easily become too unwieldy. Write your phone number your child’s arm or on a piece of paper they keep in a pocket; make sure they understand what to do if they get lost. I’m in the midst of trip-planning right now. Honestly, I love the research and time investment in planning a great trip, from picking the best kid-friendly hotel to finding out which museums are open on the days we’re in town. Yeah, I’m a travel-research geek. I cull information from a number of sites to plan a great trip for my family. They’re sort of spoiled now, though, and if I mess up — I hear about it! One thing I’ve learned: Never rely too heavily on one site (even this one! ), one friend or one guidebook. Planning a great trip takes intensive Internet time up-front, but it’s better than driving around a suburb at 7 p.m., looking for an open restaurant. And with the right amount of work, your partner and children will think you’re a travel genius. Tripadvisor Tip: The best aspects of Tripadvisor are the hotel reviews and forums; Crowdsourcing from the vacation rental reviews or restaurant picks doesn’t work for me. Chowhound: I love the Chowhound.com message boards. Those of us with pickier palates appreciate this site’s gourmet reviews. Not that every restaurant recommendation is expensive – you’re as apt to find a glowing review of a hole-in-the-wall burger joint as a upscale bistro. People on this board just love food, in all guises and pricepoints. It’s also a great way to find child-friendly restaurants at your out-of-the-way destination, if you want to ask a question on the message board. Chowhound Tip: It’s not easy to find relevant Chowhound threads using Chowhound’s search tool. I use Google and enter “site:chowhound.chow.com” and then my term – “Olympia restaurants kids.” Or browse by destination on the board. Example: Greater Seattle Chowhound recommendations and reviews. Remember that not everyone has the same tastes, and this is an anonymous message board. Take everything with a grain of salt and a sprig of rosemary. Priceline: If I’m headed into a big city for just a few days or an overnight, I use Priceline.com to pick up my room. Priceline is a cheap way to get a stunning hotel room (particularly in Seattle and Vancouver), so we have more money for eating out. Priceline Tip: Use my Priceline process to book your Seattle, Vancouver or Portland Priceline stay. I would not use Priceline for a two-star hotel in any city. There’s just too much variance in quality. Slow Travel: What is Slow Travel? According to the Slowtravel.com site’s founder, it’s about slowing down your itinerary, finding a “home base” for your vacation and just enjoying your destination without pressure. Slow travel is the perfect way to travel with kids. Most of the Slow Travel forum and site participants are Europhiles with plans for the summer in Tuscany; However, you’ll also find a North America section where you can read vacation-rental reviews , trip reports and other destination-ready suggestions. Or if you’re a local, maybe you can make a few suggestions to visitors. Slow Travel Tip: View reviews of Washington, Oregon and British Columbia vacation rental homes and apartments before booking your next hotel stay; your kids will thank you. Google Maps: I use Google Maps to map out my drive and stops along the way (I do recommend stopping at least every two hours with kids, just so don’t drive one another crazy). I find the site’s directions fairly accurate, although it’s always good to double-check directions and suggestions with a real, live human (that road may be under construction or the bus route may not operate on Sundays). Google Maps Tip: Use Google Street View to check out a hotel or rental’s exterior and surrounding neighborhood. Is the hotel in a dodgy part of town, or is the rental right on the highway? Good to know before you show up. However this visual information, like all information, can rapidly go out of date — make sure the construction cranes are still there before you break up with your hotel reservation. VRBO or HomeAway.com: If I can’t find an apartment or house review on Slow Travel, I will browse VRBO or HomeAway for a family-friendly Washington, Oregon or BC rental option, particularly if I’m staying for more than three nights. I hate tiny, cramped hotel rooms as much as the next traveler, and I find that cooking in the room makes more sense, financially. VRBO.com Tip: Read this CascadiaKids.com article on finding a child-friendly or family vacation rental in Seattle, British Columbia or Washington State. Nwcheapsleeps.org. On her blog, Lauren blogs about various bed and breakfasts and fabulous destinations throughout the Pacific Northwest. Great if you’d prefer to go the B&B route (with kids, or without!). The Cheapsleeps Finder makes searching easy. Yelp.com for restaurants at my destination. The site provides random reviews — more like a restaurant snapshot than a panoramic perspective. It also doesn’t work well for some cities; Spokane stands out in my mind as an example of a city where you do not want to take Yelp reviews into account. I found that out the hard way. AAA of Washington for finding and booking hotels that accept my AAA card (10%off). Fodors.com and Frommer’s forums; ehhh, sometimes they work for me. Sometimes not. Local mom blogs for my destination, particularly if I trust the blogger’s taste in dining. I always try to leave a blog comment if I visit and get a great local-travel tip from a blogger! I know I’ve forgotten many more important sites. Do you have favorite trip-planning site for your Northwest trip? Tell me all about it in the comments below (comments moderated, please wait for your message to post). 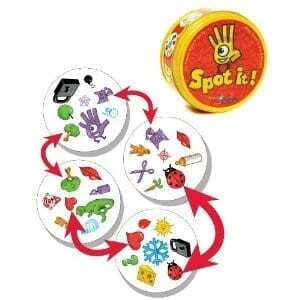 Spot It is my favorite new game, hands down. It’s easy to learn (you’ll get it in about two seconds), scales well by age (I’d say 5 and up) and comes in a very portable tin. Gift certificates to a favorite hotel or restaurant. Many come with bonuses for you, too. I’ve seen a 10% bonus for purchases for the Victoria Clipper, an extra $25 gift card when you purchase one $25 gift card at the Cannon Beach’s Wayfarer restaurant and a few more I can’t really mention — they were only for e-mail subscribers to the hotel e-mail lists. But you’ll find these sort of “secret deals” when you sign up for a restaurant or hotel’s e-mail li. A NW-centric book, like Lonely Planet Pacific Northwest Trips or (my book) Northwest Kid Trips: Portland, Seattle, Victoria, Vancouver or The Most Beautiful Villages and Towns of the Pacific Northwest. A Chicco Capri Lightweight Stroller. I don’t have the money for a Maclaren. 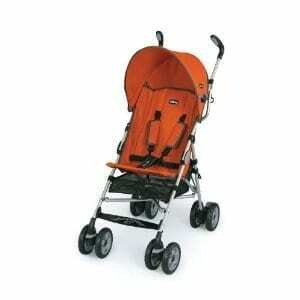 But I think a Chicco umbrella-style stroller ($65-75) is a great value for those of us on a budget. This particular stroller works well no matter what the streets throw at it — cobblestones, dips, bumps or grass-covered hills. It fits easily into most crowded urban restaurants and the handles work well for my tall husband. If you don’t want to buy from Amazon, head to your local Babies R Us, which typically has this stroller in stock. A membership to a local zoo or science center. All the better if they’re participating members of the ASTC Passport Program or the Association of Zoo and Aquariums, which allows the recipient to visit nearby cities’ zoos and science centers for free or at huge discounts. Is there anything you hope Santa brings you this year? By now, you’ve probably already signed up for one of the online coupon sites – Groupon, LivingSocial or another – so you can receive great offers directly in your in-box. 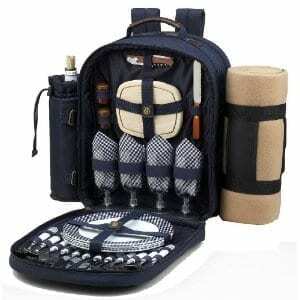 But did you know it’s also a great idea for family travelers? If you sign up for a favorite city you’d like to visit, you may discover a great deal on a four-star hotel, a favorite family restaurant or an activity you’d always thought you’d like to try but never had the money for (heli-skiing, anyone?). However, read the fine print and use your web research skills. While $40 worth of food for $20 seems like a great idea, but if your steak’s not cooked properly, the fries are limp and your margarita tastes like cleaner, its not such a hot buy. ALWAYS check Yelp.com reviews (in Canada, Dinehere.ca) for general restaurant reviews pre-purchase. The same goes for hotels. The hotel may be offering the discounted stay because few people have heard of the gem of a stay – or it could be because people have read the Tripadvisor reviews and stay away in droves. Or because it’s located at the airport, which we all know is located NOWHERE NEAR THE FUN STUFF. Or it’s located in a suburb with nothing much going on. Check Tripadvisor and double-check the location. Check the fine print on whether they’re going to charge you extra for kids (and do not buy those that do, unless you have like seven kids and you really won’t fit into a hotel room). And similarly for activities, services and memberships. I tend to think the memberships are a great deal, particularly in your own city – but sometimes also in cities you plan to visit. At 50% or more off, you may still be saving over the typical family admission. Check fine print about expirations and who’s included (adults only? Kids?). Finally, one more caveat. Many small businesses feel like the coupon sites are a terrible deal for them – charging immense fees and leaving the small biz unprepared for the onslaught of cheapskate customers. A small biz will have to determine for themselves whether this form of marketing works, but I do advise always tipping for the full amount and not cheaping-out too much. Groupon.com. The Big Daddy of online coupon sites, Groupon is (at this point) one of the best sites to sign up for – there’s a daily deal for every metro area, generally, and most are pretty solid. I’ve seen amazing deals here — 50% off Victoria Clipper fare, great hotels, cool experiences. I dread reading the copy, however. I wish they’d ditch the hyper-adjectives and just give me the information. My sneaking suspicion: Groupon uses MadLibs to write each description. Destinations covered: Vancouver BC, Victoria, Tacoma, Seattle, Portland. LivingSocial.com operates much like Groupon, but it also offers the appealing “LivingSocial Escapes,” often to local destinations (Whistler, etc.). Without the annoying writing style. Destinations: Bellevue, Portland, Seattle, Tacoma, Eugene, Vancouver (BC). 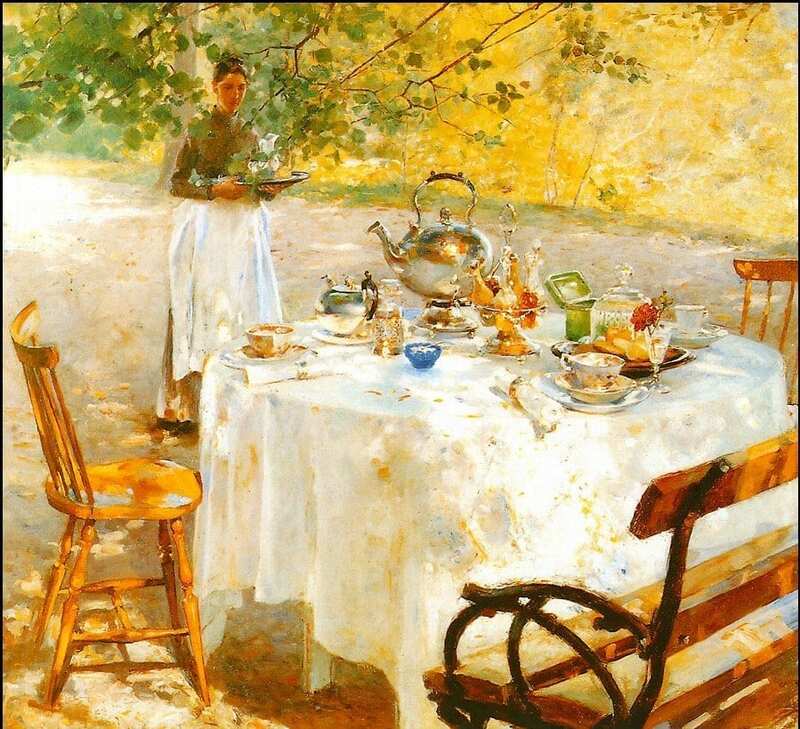 Wagjag.com has offered some fabulous boutique hotel stays and restaurants. I’d sign up for this one if going to Vancouver at any point soon. Savvy Source and Mamapedia are both for parents, and often present cool deals for family-centric activities (plays, museums, symphonies, ballets). Of course, sometimes the bargains are a dud or not really family-pertinent, and they’re very limited in cities offered. Goodnews.com and Stealthedeal.com are also both offered in Vancouver, BC only. Goodnews.com combines local deals with local charitable causes – so you can feel doubly good about your discounted dinner or gelato. Destinations: Only offered in Vancouver only at this point. Dealpop.com is the WhitePages entry into the market. Eh. There have been one or two items that are mildly appealing. Did I miss any coupon sites that offer savings for family travelers? Active-duty U.S. military personnel save 10% on Amtrak, while VIA Rail Canada offers 25% off fares for Canadian active personnel and veterans. Disabled veterans can benefit from free camping in Washington State Parks through the Washington State Parks Pass Program. Both disabled veterans and active military on leave can get a special access pass for camping in the Oregon State Parks. Great Wolf Lodge, in Grand Mound, Wash., offers discounts to Armed Forces members, with the word HEROES entered into the code box of the reservation page. Proof will be required, and you might check with the hotel in advance to ensure you’re getting a great deal. Check the “deals” options offered through Northwest Military. Canadian and US military can benefit from the Victoria Clipper’s special “Military and First Responder Appreciation” rates. The Military Merits site offers BC, Washington and Oregon hotels with military discounts, along with family attractions, museums, gardens and restaurants. A great site, particularly for travel in the Pacific Northwest. Veterans Advantage Card, for around $50/year, offers 5% off Continental airlines, 15% off Amtrak and 20% off Choice Hotels, among other deals. Are there any military discounts or deals you’d like to add to the list? Just because school’s in session doesn’t mean you have to swear off all family getaways. In fact, non-summer travel offers some of the best bargains on hotel and transportation options. 1. Shoulder season travel is a steal. Spring and fall are called “shoulder seasons” in the travel biz. Book during the shoulder season, and you’ll typically save about 25% off of summer prices. 2. Winter offers dark days and deep discounts for hardy travelers. Up to 40% in some tourism-dependent regions like Victoria, BC and the Oregon Coast. If you select a city location with plenty of indoor options (Seattle, Portland, Vancouver or Victoria), you may be happier and drier. 3. Research weekend getaways that only require a two- or three-hour drive. From Portland, a Friday night departure can offer two full days for coastal stormwatching. Remember though that winter nights start early in the Pacific Northwest – around 4:30 p.m. – so for a daylight drive, see whether you can leave work a few hours early or pick your child up at noon. 4. Return home on early Monday mornings to ensure a full weekend getaway. We typically leave Vancouver, BC at 5:30 a.m. The kids sleep en route, and we arrive in time for work and school. 5. Plan a trip around a long three-day weekend falling on a holiday like Veteran’s Day or Remembrance Day. Then take the kids out on Thursday for a five-day fall or spring vacation. Or look for teacher in-service days (which seem to fall in random fashion), which can also give you three-day weekends. 6. Select a destination with plenty of hands-on learning possibilities. Particularly if you’re going to pull the kids out of school for a few days, Seek out museum-rich cities, tidepool-dotted coasts and historical sites. You may even find an educational option on your trip, such as a glass-blowing class at the Museum of Glass (ages 8+), create a historical lantern at the Burnaby Village Museum or a engage in a hands-on science lab at OMSI where kids can build robots or dissect a squid eye (ew). 7. Chat with your child’s teacher beforehand. Many teachers are OK with a short trip or smarts-building journey. Offer to create a parent-child journal or online blog while on vacation and spend a half-hour reading and writing about the smart stuff you’ve learned while traveling. But ensure that you’re not leaving during the class pizza party or an important test. 8. Integrate learning into your travel day. Money management teaches math, reading a ferry schedule is real-world time-telling, a museum weaves real stories into history and beachcombing reveals natural science. But remember, you’ll need to take the lead on integrating fun, interesting facts and learning opportunities into the day. Do your parental homework when choosing a destination (#6) and researching the trip. 9. Bring a little homework help. Worried about your child falling behind? It’s unlikely that five days off will ruin your kid’s future at Harvard. (But you’re taking advice from someone who never did any homework until sixth grade. Long story.). If you’re so compelled, ask the teacher what will be covered. Some parents worry more in middle school, but by this age, your child should be able to juggle assignments. If not, then a three-day holiday break may be best. 10. Listen to your child. If they resist a school-year trip because they’re afraid of missing out, that should be respected as well. Seek a series of days that work well for everyone’s schedule. Do you have any suggestions or advice for taking kids out of school to travel? What’s worked for you? Imagine creating a gourmet spread in your temporary house: warm Seattle-baked bread, locally-crafted cheese, and tiny strawberries from Seattle’s Pike Place Market. After lunch, your toddler naps in the house’s second bedroom while you catch up on your reading. She wakes and you head to the local playground. There, your family exchanges a hello with newfound friends. It’s like a little slice of Northwest life. Or perhaps you’d rather stay on the San Juan Islands, where water laps the shore outside your door. Then again, how about a condo in Portland’s Pearl district? If only to be closer to the neighborhood pub – which welcomes children, of course. Vacation rentals are both romantic and practical. You experience life as a temporary local, while children enjoy solid home base. You get to enjoy local food, the kids usually have more room to roam and you may find that a vacation rental price is equivalent to (or less than) a standard hotel room. Vacation rentals are often a great idea for families with kids who don’t “travel well,” as the homelike atmosphere is reassuring. Yet, not all temporary stays are equal in terms of amenities, location, and layout. Here’s a guide to renting with kids. Vacation rentals in metro Vancouver, Washington countryside or on the Oregon Coast? What’s your domicile style? From North Cascades farmhouses to Vancouver’s cosmopolitan condos, vacation rentals exist in every Northwest and BC locale. Choosing your location first (city, country, or suburb) will determine rental options. In the countryside and on the Washington, Oregon and BC coasts, vacation rental houses welcome large families, or those with young, very active children. It’s easy to explore a wide radius from your “home base” (a la Slow Travel) from a rural home, via car. Look for access to arterial roads and plentiful parking. Rental condos and houses are available throughout in Northwest and BC neighborhoods. All cities in the Pacific Northwest and BC offer multiple family-friendly areas: Try a vacation rental in Kitsilano (Vancouver), Phinney Ridge (Seattle), Oak Bay (Victoria) or Hawthorne (Portland). In-city living means you won’t need a car – or at least not as often. Buses, bikes, and strollers will take you to museums or restaurants. When narrowing your location to a specific home or condo, look for nearby physicians, hospitals, grocery stores, farmer’s markets, and other important services. Most vacation-rental owners present a notebook upon your arrival, with emergency contacts and local services. Ask friends for suggestions and pore through vacation rental reviews to find prescreened gems. Search a vacation rental-by-owner website or do a Google search. My favorite Google term: +city +”children welcome” or “Kid friendly” +vacation rental type (apartment, house, condo) or +vacation rental. If you’d rather browse a rental website, most listings specify whether children are welcome, or only children over a certain age. A quick way to tell if families are a benefit or a burden? If the rental listing says the vacation home accommodates two, they’re probably thinking of honeymooners, not the Hansen family. The rental owners probably won’t be happy with even a parent/child duo. Take note of the vacation home’s rental measurements. Personal space becomes more important as children age. But “enough” can be as simple as a small nook for favorite toys or clothes. Multiple bathrooms are nice for teens, who need more time and room to prepare for the day. When renting a condo, ask about bedrooms – are they separated by a full wall or a partial wall? Does the couch fold into a double-size bed? Small infants or toddlers can sleep in a port-a-cot or in bed with mom and dad. We rarely rented an apartment with more than one bed until our daughter was two. And whatever your children’s ages, inquire about noise levels inside the apartment or house (for longer naps). Are the walls thin? Can you hear neighbors or street noise? Is construction going on across the street? Look for solid, high railings on balconies, particularly the second floor and up. If the ground-floor sliding door opens onto an outdoor area, ask whether there’s a fence. Ask about safety issues, such as a scalding hot water heater. You can also bring or buy simple childproofing fixes (door handle covers, duct tape for electrical sockets). Traveling with teens? Teens want the autonomy to explore, shop, and run errands. Will your Seattle vacation rental’s location allow that to happen? Is it fairly safe? Some families don’t need vacation rental-provided entertainment, preferring to bring their own books or games from home. Other families pack light and appreciate a well-stocked library of books, magazines and/or board games. While not a necessity, television is certainly one way to settle into a destination (and give mom and dad a break). We like to ensure that there’s a DVD player in our rental, and either bring movies from home or pick up rentals from a nearby city. Check out on-site recreational facilities if renting in the countryside. And many condo-style vacation rentals offer pools, hoops or small play structures. If renting with younger children, onsite equipment will make a stay easier. Owners often make cribs, high chairs, toys and strollers available (make sure they’re up to date — not 1970s baby-jail cribs). Some owners don’t have items onsite, but can acquire them from friends/relatives – it’s always worth asking if your vacation rental will have the equipment most helpful to you. If you’re bringing baby gear with you, ask about storage areas. Can you park a stroller in the entryway? Here’s the part where things can get worrisome. Find out what’s included in your rental price. Electricity? Water? Maid service? Final cleaning? When comparing the total cost to staying in a hotel, make sure your expense will be offset by eating in your rental (and if you’re planning on eating out during your stay, then you might rethink the rental). Next, you may find that the rental owner will bargain with you if you’re willing to be flexible, as well. Do you get a price break if you agree to stay a certain number of days? A mid-week break? Can you agree to clean the house to Mary Poppins standards, in exchange for skipping the cleaning fee? Most vacation rentals will require a deposit when you book your stay. Depending on how near you are to the final check-in, you may have to pay most or all of your fees upfront. Find out whether you can pay by credit card — but remember those exchange fees (charged by your card issuer) if you plan to pay for a cross-border rental. A washing machine in your vacation rental spares rigging your bathroom as a laundromat. No washer or dryer? Inquire about nearby laundering facilities, or bring your Woolite and laundry accoutrements. Ask about heating in winter, and air-conditioning in summer. Is heat included in the cost? Air-conditioning isn’t considered a necessity in most Northwest and BC homes, so you may not find it in a Vancouver vacation rental. Take a look at photos or ask questions. Can you boil a big pot of pasta on that burner? Will your family of five fit around the table? Is the fridge full-sized or a miniature version?Microwaves provide a handy self-serve option for older children and teens. In-home dining is a key benefit to a rental, so ensure that the food prep and dining space meets your needs. In one vacation rental, we only found dishes and silverware for two, although the ad said it was furnished for four. After the owner’s dash to the store, we had plates for everyone. _ Size of vacation rental (measurement of total size)? _ Number of beds and bedrooms? _ Are there any safety issues a parent should be aware of? Railings, hot water, heaters, gas ovens? _ Are there adequate bathrooms with showers or bathtubs? _ Is the furniture sturdy? _ What’s the size of vacation rental? _ Is it noisy outside? How much noise can my kids make without disturbing others? _ TV with DVD player or cable? _ Books, magazines, or board games? _ Recreational facilities on-site: large yard, pool, swingset, tennis? _ Baby/toddler equipment: Crib, high chair, stroller, toys? Storage for items from home? _ Washing/drying facilities on-site or nearby? _ Adequate food storage, cooking, and dining space for your family size? _ Is there a playground/park/play space nearby? _ Where is the nearest pedestrian/shopping zone? _ How close is the nearest physician or hospital? _ How close is the nearest 24-hour pharmacy and grocery store? _ Is the neighborhood safe? Can older kids and teens go out alone? You’re bored with hotels and bed and breakfasts and inns and tents. You want something different. Oregon offers quirky stays, from lighthouses to lookouts, suitable for a variety of ages. Take a look at these sweet sleeps — and if you go, let us know! 1. Oregon teepee in Warm Springs, Oregon. At Kahneeta Resort & Casino, bring your own inflatable air mattress and comforters – you’re sleeping in a Central Oregon teepee! This 21-foot canvas arrangement allows you to enjoy the resort’s waterslides, pool and lovely weather for less than a hotel stay, and each teepee accommodates up to 10 people. Teepee best for ages: All ages. 2. Oregon treehouse in Cave Junction, Oregon. Sleep in treetops! At Treehouse Out ‘n’ About Treehouses, try the fort-style “Cavaltree” stay or the “Swiss Family” wood-paneled treehouse, which offers a child-size single bed and rocking chair along with a kids’ unit, connected by a swinging bridge, bunk bed and a mini table and chairs. Breakfast included. Treehouse pricing: $90-240, children over age 4 are $20 extra per night over occupancy, under 4 are $10 extra. Treehouse best for ages: All ages. 3. 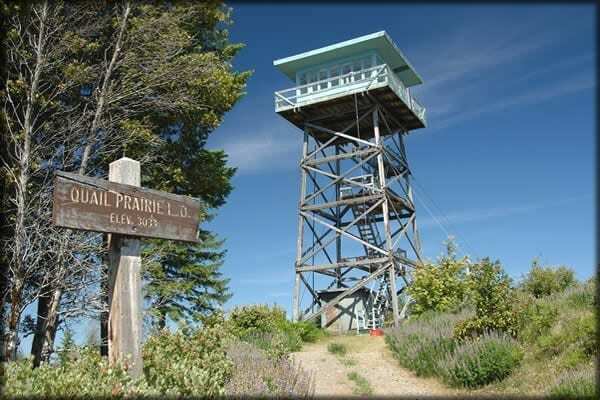 Oregon fire lookout, multiple destinations. Have a budding forest ranger in your home? Climb up a ladder to an enclosed viewing platform, where your family can eat, sleep and watch lightning storms roil through Oregon skies. Oregon fire lookouts offer tight quarters, but amazing, expansive views — and are set in the middle of utter wilderness. Check out the Lake of the Woods lookout in Southern Oregon. Fire lookout pricing: $40 and up. Fire lookout best for ages: Ask when making a reservation if the fire lookout is a good match for your child — some are too steep for your child’s (or your) comfort, while others are very accessible. The fire lookout in the photo at right is suitable only for children ages 12 and up. 4. Oregon lighthouse in Yachats, Oregon. At the Heceta Head Lighthouse, you’ll climb wooden steps up a decommissioned, ocean-front lighthouse, then cozy into a sky-high room. With small rooms that accommodate only a trundle bed, Heceta Head may not be a choice for larger families—unless you rent the whole lighthouse! Lighthouse best for ages: Ages 10 and up. 5. Oregon yurts, multiple destinations. Yurts are like the lovechild of a tent and a cabin. Oregon State Parks’ family-friendly yurts protect you from the elements, offer kitchens and covered porches. The deluxe yurts are the best bets for families – but book now (especially for Oregon Coast yurts), because these affordable sleeps are popular and can be booked up to a year in advance from 2 days to 9 months in advance. Do you know of a unique or unusual Oregon places to sleep? Have you stayed in one of the quirky accommodation options listed above? Let us know!